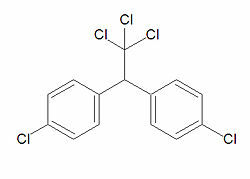 DDT, abbreviated from Dichloro-diphenyl-trichloroethane, but correctly called by its IUPAC name 1,1,1-trichloro-2,2-bis(4-chlorophenyl)ethane is an organochlorine pesticide that is very effective at killing mosquitoes and was used effectively in the fight against malaria. The campaign against DDT was started by Rachel Carson with her book Silent Spring. While DDT itself is safe, DDT breaks down into DDE(dichlorodiphenyldichloroethylene) and DDD(dichlorodiphenyldichloroethane). DDE has been classified as a possible carcinogen by the EPA. DDT was banned in 1972 by the Environmental Protection Agency under Administrator William Ruckelshaus, but it is still used in some countries. This page was last modified 12:51, 8 June 2009.